Nepta plants are a group of worldwide distributed flowering plants that belong to the Lamiaceae or mint family. 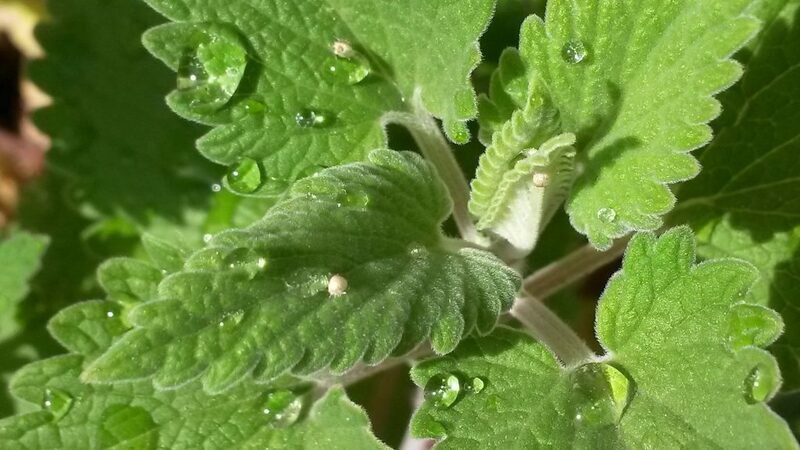 As with most mint family plants, nepeta plants contain an essential oil that is rich in healing phytochemicals. Mice fed repeatedly with normal chow enriched with 10 % Nepeta cataria (catnip) leaves experience significantly reduced immobility in experimental tests of despair, indicating the extracts have a significant antidepressant activity. This supports other studies that show that nepeta plants may have significant central nervous system effects, including anxiolytic effects. However, only certain types of extracts appear to be beneficial at causing antidepressant effects, and this may relate to the differing solubilities of the active ingredients. For example, non-polar solvent extracts exert significant antidepressant effects, but polar extracts do not. The chemical responsible for the antidepressant effects is therefore likely only soluble in non-polar solvents, suggesting it has some of the chemical properties of a lipid. Nepeta cataria is called catnip because the fresh or dried plant and its extracts can induce extreme please manifestation cats. Nepeta is a group of flowering plant belonging to the Lamiaceae, or mint family of plants. Nepeta plants are distributed throughout the world. Nepeta cataria is perhaps the most well known example, and is commonly known as catnip, catswort or catmint on account of its attractiveness to cats. As with many plants in the Lamiaceae family, nepeta plants may have particular anxiolytic effects. 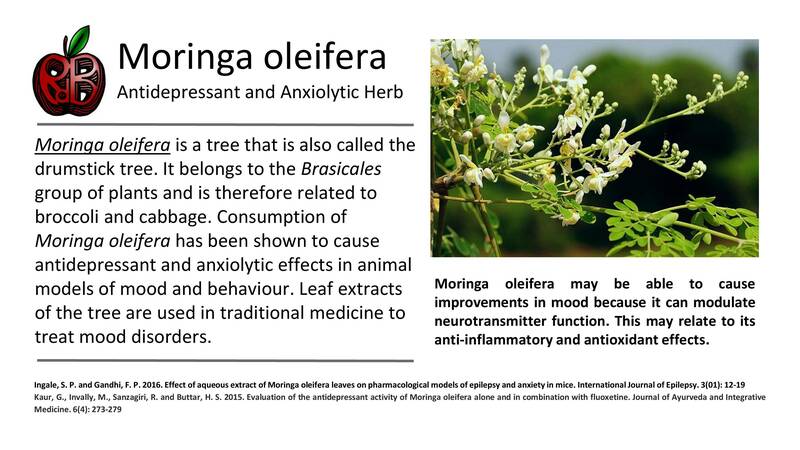 For example, in one study, researchers investigated the effects of extracts of aerial parts of the Nepeta persica plant on the anxious behaviour of mice. This species of nepeta is found in Iran. The mice were administered the plant extracts and exposed to experimental stress. At 50 mg per kg body weight, the extract was observed to have significant anxiolytic effects, but did not cause a loss of locomotor activity or any sedation. However, at lower doses the extract produced a sedative effect and at higher doses the plant produced a stimulatory effect, suggesting significant central nervous system effects. Nepeta species are widely used traditional herbal medicine. In this regard the plants are claimed to possess antispasmodic, expectorant, diuretic, antiseptic, antitussive, antiasthmatic and anxiolytic effects. Nepeta cataria (catnip) is perhaps the most well known Nepeta plant. The flowers of the plant may have particular use as a sedative and anxiolytic agent. Studies suggest that the main constituents of Nepeta plants are an essential oil that contain diastereomeric nepetalactones. Nepetalactones may exert sedative effects are are thought to be responsible for the plant’s effects on cats. Image is of catnip. Posted in Anxiety, Depression, Mood, Nepeta Plants (catnip)	| Comments Off on Nepeta Species: Anxiolytic Plants? Pachyrhizus erosus is a vine from the Fabaceae or legume family. The plant is native to Mexico. 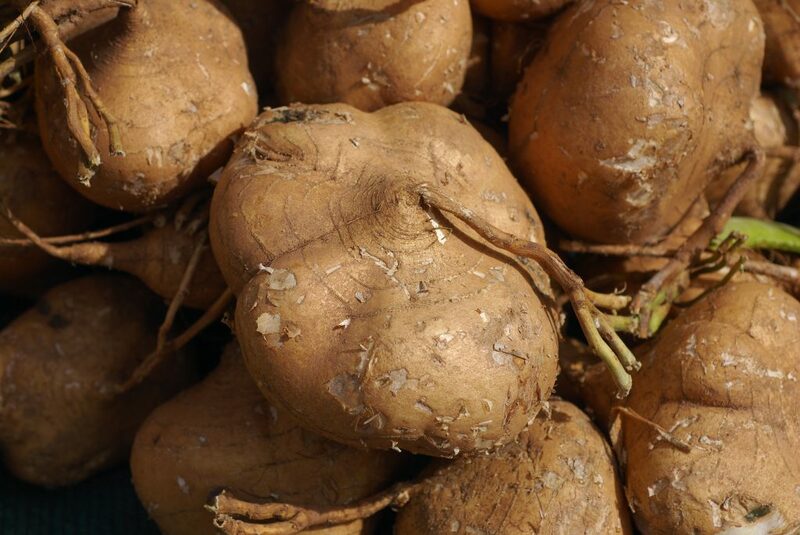 Common names for the plant include jicama, Mexican yam bean or Mexican turnip. The root of the plant is edible and the seeds (legumes) can also be consumed. The central nervous system effects of Pachyrhizus erosus has been investigated in mice. For example, in one study researchers administered extracts of the seeds of Pachyrhizus erosus to mice and then exposed the mice to a number of experimental protocols to assess central nervous system effects of the extracts. The results of the study showed that the extracts of Pachyrhizus erosus had significant anxiolytic and myorelaxant effects. In addition the extracts also significantly decreased locomotor activity and caused a reduction in aggressive effects. Therefore the extracts of Pachyrhizus erosus had significant central nervous system effect that may explain the use of the plant as a spasmolytic agent in traditional medicine. Like the seeds of most leguminous plants, the seeds of Pachyrhizus erosus contain isoflavones, a sub-group of the flavonoid group of phytochemicals. Phenylcoumarin, a phenolic compound is also present. These phytochemical may explain some of the antioxidant effects of the seeds of Pachyrhizus erosus. As antioxidants have been shown to produce anxiolytic effects, this may explain the observations of mood elevation from consumption of Pachyrhizus erosus. Image is root of Pachyrhizus erosus. Image from: Eric in SF – Own work, CC BY-SA 3.0, https:// commons.wikimedia.org/ w/ index.php?curid=4324665. Paeonia suffruticosa is a hybridised plant species that belongs to a group of plants of the Vaginatae family, often referred to as tree peonies. The plant is cultivated in China and used as a traditional medicine. Studies show that root bark extracts from Paeonia suffruticosa may cause sedation and may be useful in treating central stress. 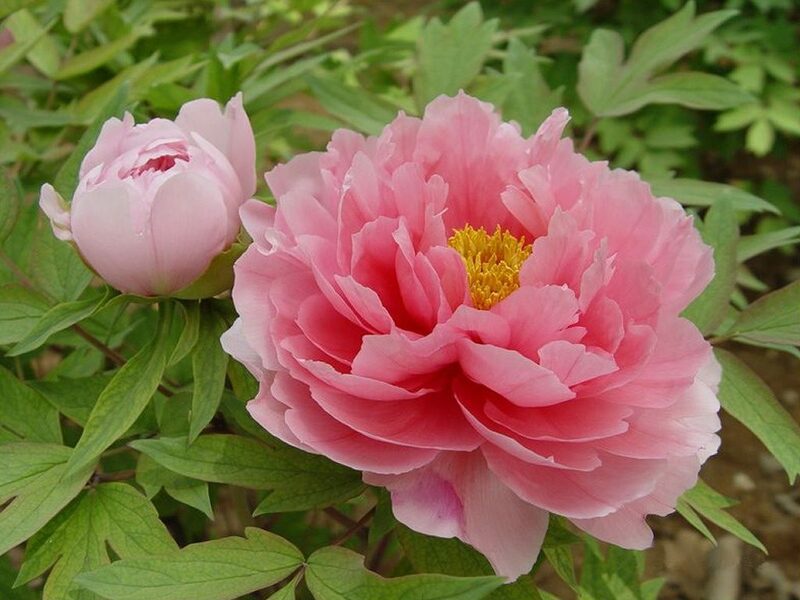 The medicinal effects of tree peonies may stem from the presence of phenols within the roots, and Paeonia suffruticosa contains the phenol paeonol (2-hydroxy-4-methoxyacetophenone). One study investigated the effects of paeonol on the activity of the monoamine oxidase enzymes A and B and found inhibition of both forms. In this regard, paeonol was slightly more effective at inhibiting monoamine oxidase B, compared to A. As these enzymes are responsible for the breakdown of the monoamine neurotransmitters serotonin, noradrenaline and dopamine, this could indicate that paeonol is the active component within Paeonia suffruticosa that causes its central nervous system effects. Red ginseng is a herbal treatment derived from the Panax ginseng plant. The root of the Panax ginseng plant is steamed and then air dried to produce red ginseng. Evidence suggests that red ginseng has mood elevating effects in humans. For example, in one study, researcher administered Korean red ginseng to postmenopausal women with climacteric syndromes such as fatigue, insomnia, depression and anxiety. The subjects received 6 grams of Korean ginseng each day orally. At baseline the women with climacteric syndromes had significantly higher levels of cortisol and lower levels of a steroid hormone dehydroepiandrosterone (DHEA), compared to controls. When the women were treated with Korean red ginseng, their levels of fatigue, insomnia, depression and anxiety returned to the normal range and their cortisol to DHEA ratio was significantly reduced. The authors of the study concluded that fatigue, insomnia, depression and anxiety of the women may have improved because of an anti-stress effect by the ginseng. The main active component of various ginseng plants may be compounds called ginsenosides. These are a group of structurally related saponin compounds. However, evidence suggests that certain species of ginseng have different ginsenoside profiles compared to others. For example while American Ginseng varieties may contain 19 ginsenosides, Korean ginseng varieties may contain 38 different ginsenosides. 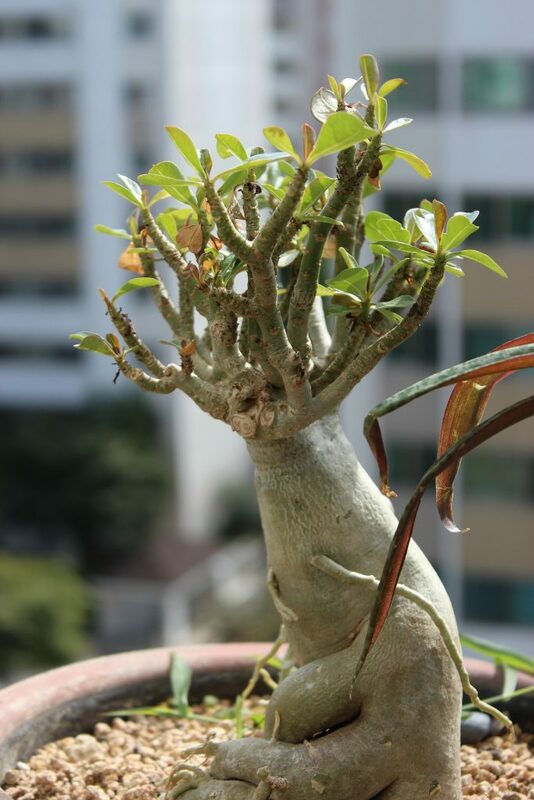 This may explain the different physiological effects of various ginseng species. 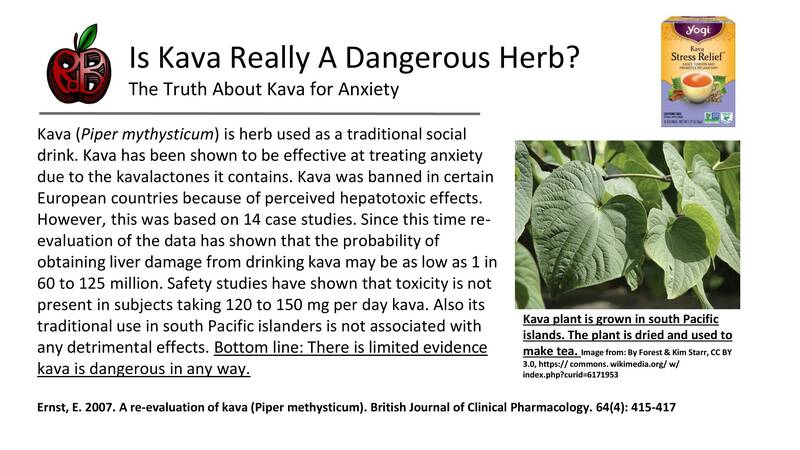 Posted in Anxiety, Depression, Kava, Mood	| Comments Off on Is Kava Really A Dangerous Herb? Panax ginseng root is a traditional Chinese medicine treatment for stress, fatigue, and mental and physical exhaustion. Panax ginseng is classed as an adaptogenic herb because it provides a non-specific ability to balance homeostatic function, and in particular, brings the bodily function back to its norm from a direction of altered physiological function. The Russian botanist C. A. Meyer coined the genus term panax, which derived from the Greek terms “pan” which mean all and “axos” which means cure. The species name is derived from the Chinese word “jen-sheng” a word that implied the root resembled a man’s body. 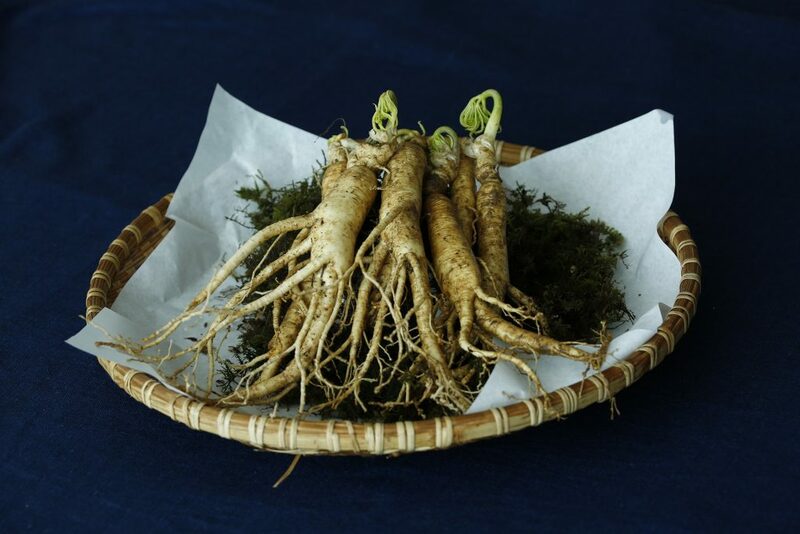 A number of different types of ginseng are available, and this included red and white types,. Red ginseng is produced by steaming the root, followed by air-drying.White ginseng is produced by just air-drying the root. These two methods of production may alter the chemical composition of the root extracts and therefore may produce slightly different physiological effects in animals and humans. Ginseng was mentioned in the Shang Han Lun, an ancient Chinese medical text, written in the second century AD. However, it is thought its use as a tonic and restorative may date back 5000 years, based on historical accounts. Panax ginseng has been investigated for its ability to improve mood in animal models of anxiety and it appear to be effective in this regard. One study investigated the effects of red and white ginseng extracts on the behaviour of mice exposed to experimental stress. Mice were given a red or white ginseng extracts orally for 5 days at 20 and 50 mg per kg body weight. Both extracts were significantly effective at reducing the anxious behaviour of the mice when exposed to experimental stress. Pentylenetetrazole was administered to the mice to reduce brain levels of monoamine oxidase (an enzyme that breaks down the monoamine neurotransmitters). However the extracts of ginseng were able to reverse this effect, suggesting that one of the ways they may work to reduce anxiety is through causing changes to monoamine levels in the brain. Further in this study, the effects of ginseng were comparable to that of the benzodiazepine drug diazepam. Ginseng may therefore be an effective treatment for anxiety. Passiflora foetida is a species of passionflower often called wild maracuja, bushpassion fruit, wild water lemon or stinking passionflower. This species of passionflower is native to South, Central and North America. Passiflora foetida is a creeping vine with an edible fruit, and when damaged emits a pungent smell from its damaged foliage, hence its common name stinking passionflower. Researchers have investigated the mood elevating effects of Passiflora foetida on animals. In one study, researchers administered methanolic extracts of Passiflora foetida plants to mice and then exposed them to experimental stress in order to cause depression like behaviour in the animals. The extracts of passionflower were significantly effective at decreasing the depressive symptoms of the mice. 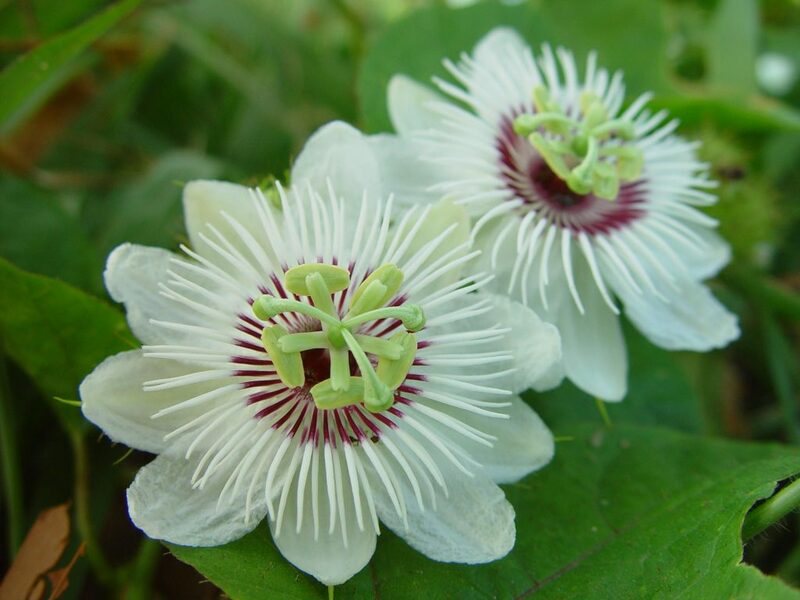 In this regard the passionflower was as effective as the antidepressant drugs fluoxetine and imipramine. 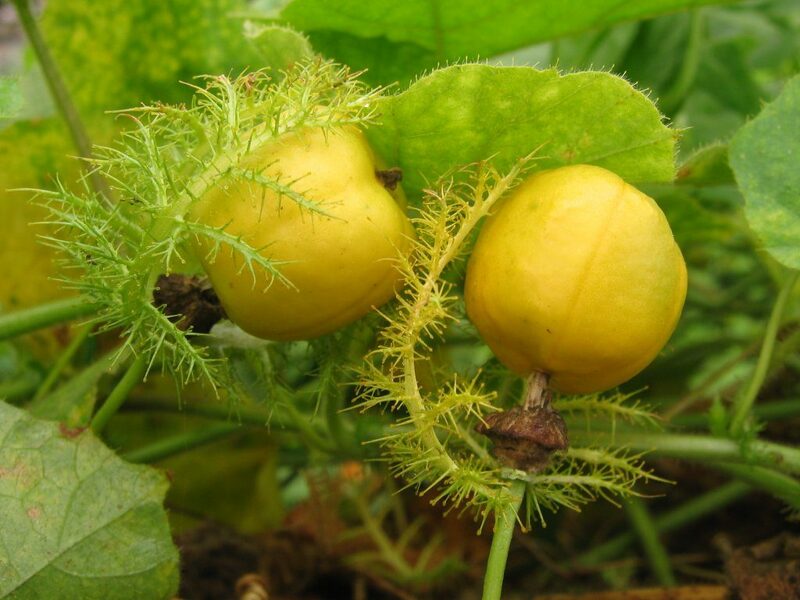 The authors concluded that passiflora foetida extracts exert antidepressant effects on mice. Passiflora foetida flowers. 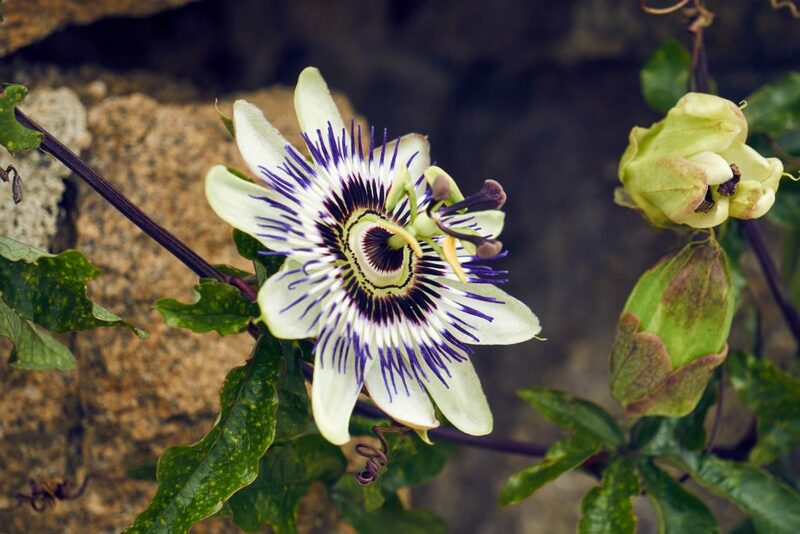 Passionflower has been most extensively researched for it anxiolytic effects, but studies also show an antidepressant effect for extracts of certain species. Image from: By Leon Brooks – http:// www.public- domain- image.com / public- domain- images- pictures- free- stock- photos/ flora- plants- public- domain- images- pictures/ flowers- public- domain- images- pictures /passionfruit-cream.jpg, Public Domain, https:// commons.wikimedia.org/ w/ index.php?curid=24918864. Passiflora foetida fruit. Passionflower species of plants contain a number of phytochemicals that may explain their antidepressant effects. These include flavonoids and alkaloids of various kinds/ Like all passionflower species, the fruits of Passiflora foetida are edible. Image from: By Vvenka1 at en.wikipedia, CC BY-SA 2.5, https:// commons.wikimedia.org/ w/ index.php? curid=3657316. Benzodiazepines tend to be used to treat anxiety, but they can cause dependence and there is a risk of death with their use. Alternative treatments for mild to moderate anxiety are therefore of interest as they tend not to be associated with any adverse effects. Passionflower is one such alternative remedy. Passionflower refers to a group of plants that contains over 400 species and many of these have been shown to have beneficial effects against anxiety. Most studies on the anti-anxiety effects of passionflower have investigated Passiflora incarnata, a European species of passionflower. However, other species appear to show similar properties and this may relate to the fact that the different species have similar phytochemicals within their extracts. These phytochemicals include the flavonoids chrysin and luteolin, and the alkaloids harman and passiflorin. Of the flavonoids present in Passiflora plants, the flavone chrysin has been shown to be an important active component that is required in part for its anxiolytic effects. For example, in one study, researchers investigated the effect of chrysin extracted from Passiflora incarnata on the behaviour of rats. Rats were injected with chrysin and then exposed to experimental stress to induce anxiety. The rats receiving chrysin demonstrated significant reductions in their anxious behaviour and this effect was similar to that seen from the benzodiazepine drug midazolam, but of a smaller magnitude. It has been hypothesised that chrysin is able to decrease anxiety through interaction with the GABAA receptor in the central nervous system. Chrysin has been suggested to be to equipotent to the benzodiazepine drug diazepam but without the sedative or muscle relaxant effects.